Tied arch bridges, the first of which (in the US) was the Wilson River Bridge on the Oregon coast, built by Conde McCullough, use the roadbed to tie the ends of the arches that hold the roadbed up by a series of stringers... Built in 1931 of reinforced concrete it is approximately 120ft long and resembles the cross-section of our vault, with the stringers replaced by rammed earth walls that maintain the spread of the vault and slab floor, and with the vault´s and floor´s reinforcing mesh to tie the vault´s ends at the springlines´ footers... To get a feel for proportions, we note that some of Robert Maillart´s early ferro-concrete arch bridges span 300ft and are only 7" thick... recognizing that concrete has improved in strength since the 1930s when these bridges were built, these dimensions suggest the adequacy of 2" thick ferrocement for a 110´ span vault and we will present calculations and logic to support that. If these external loads were distributed differently, then we would have modeled the appropriate catenary shape by suspending proportional weights from the chain and graphically deriving the shape of the chain to get the form with pure tensile forces to invert in order to get the purely compressive vault having those distributed loads. Comparison to circular vaults shows that a shallow 1/5th arc of a 93´ radius circle differs by less than an inch at any point along the curve from the catenary described, confirming the usual statement that the circle above the 10o´clock to 2o´clock points is the compressive arc of the circle... so now we have a couple formula approaches available for analyzing our design vault..
For this display we will do only the 3rd, though the basics are the same. 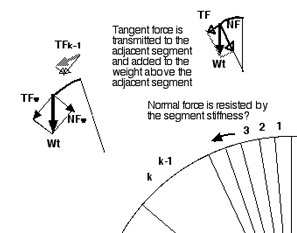 Here each Wt is analyzed into its tangent force TF and its normal force NF.. The table displays the data on a transverse cross-section of the vault, which is naturally an arch that is 1´ thick and wide. It divides the span of that arch into 1´ segments and displays one side from peak -- at 0 -- to springline -- at -55. 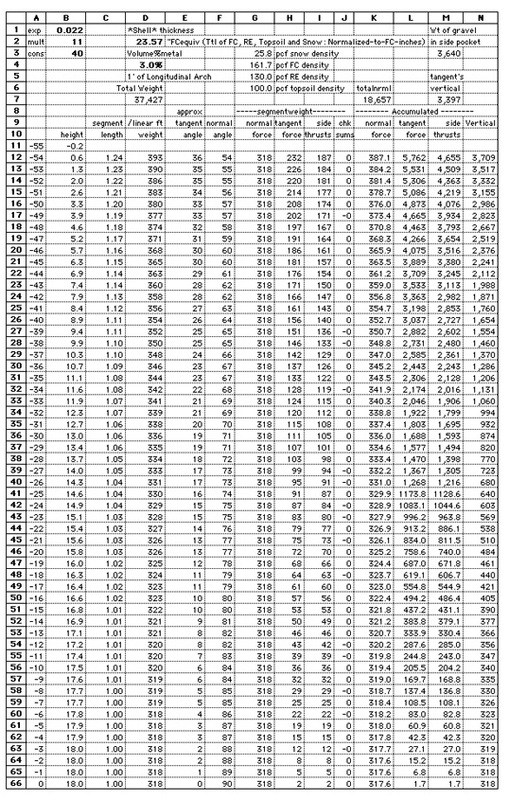 Analysis of the spreadsheet begins at the bottom, where the data on the forces at the peak of the arch are located, and proceeds upward -- segment by segment down the arch -- accumulating the forces til we reach the springline. There we see that the weight of the arch -- shell, earth- and snow-loads -- produces a side thrust of 4,655lbs to be held by the tie/wedge combination, and a vertical force of 3,709lbs on the foundation. The side-thrust is from one longitudinal foot of vault and hence is applied through a cross-sectional area of 1sqft, but the acting crosssection is the 2" ferrocement shell which has then a 24si area to sustain the tie to the foundation against the side-thrust. At 4,655lbs/sf, this translates into a little under 200psi -- which should be manageable for ferrocement. Specifically, the tensile strength of the ferrocement connection of the slab to the shell should be between 600 to 1,000psi -- taken from a paper by Namaan in which he concluded that the tensile strength of ferrocement is the same as the load carrying capacity of the reinforcement, which translated into values in this range for 3% volume fraction designs using ordinary steel. Similarly the force on the floor is spread over the cross-section of the ferrocement shell yielding a substantial safety factor. Which leaves the normal forces pressing into the shell to be considered. They range between 318-350lbs for the segments that span the unsupported overhead area and require an analysis of the stiffness of the material of the arch/beam, as well as the load-carrying stiffness of the shape. According to Bruce King´s book, Buildings of Earth and Straw, the modulus of elasticity (E) for the rammed earth part of the shell is 750 times its compressive strength. Estimates of the compressive strength of well-compacted rammed earth vary from 400psi to 2500psi at 56 days. Part of the variation is soil/cement/water mix, part is cure, since rammed earth continues to significantly increase in strength over an extended time frame so testers who measure strength based on concrete´s timetable significantly underestimate rammed earth performance. Since the lower estimates tend to be older, for our purposes, a conservative value of 1300psi for compressive strength and 1M psi for E will be chosen as reasonably attainable. Since ferrocement is more flexible -- with a modulus of elasticity between 1M-9Mpsi, the contribution to stiffness is primarily the function of rammed earth. 1-- If the ends of a beam are fixed -- monolithic, bolted, etc -- they contribute to the stiffness and strength. Specifically, fixed-end beams deflect only 1/5th the deflection of simply supported beams. 2-- For a continuous grid or slab, a specified deflection only requires 2/3rds the thickness of a beam to span the same distance. 3-- The thickness of a concrete arch is 1/20th - 1/30th of its radius, but the concrete dome of the same radius need only be 1/200th - 1/300th of its radius to achieve the same stiffness. Amazingly, a reinforced concrete dome of 100´ span and 2" thick will deflect at its top, where the maximum deflection is located, by 1/10th of an inch. To apply these gems, visualize the vault as a continuous grid of beams (longitudinal cross-sections) and arch-beams (transverse cross-sections). The longitudinal beams are very nearly rectangular in cross-section, about 1´ in breadth and 1.25´ in depth, the depth built of layers -- 2" of ferrocement on its tension side (opposite the load), 10" of rammed earth, 5" of polyethylene foam insulation (which appears competant of transmitting loads), and 0.5" of ferrocement sheath making up its roughly15" depth. Long and straight as beams are usually visualized, these longitudinal beams are anchored at the endwalls solidly. So we´ll approximate their contribution to the shell´s tendency to deflect under the forces normal to the shell before working with the arch-beams. L=the length and I=the moment of inertia. something in the vicinity of 1Mpsi for E, all we have to find is I. To account for our beam having fixed-ends, we simply divide this deflection by 5, per the 1st relationship in our repertoire. where b is the breadth and d is the depth (the dimension in-line with the loading). All together these ingredients combine to give a tendency to deflect of 2.5", or 1/312th of its span. A little over the 1/360th of the span usually designed for beams but we still have the contribution of the arch-beam to include. Remembering that our arch-beams spanning 110´ are tied monolithically at their ends, their 15" depth should enable them to perform like 22" deep archs of the same span. But fortuitously, 22" is exactly 1/30th of the radius of that span and the usual half-circle arch 22" deep, spanning 110´, according to the 3rd relationship, performs like a dome of 110´ and 2.2" thick, presumeably deflecting a mere 1.1/10th of an inch. But our arch-beams with that depth and span have a radius that is 1.7times the radius of the fortuitous half-circle arch-beams so our deflection is less the 4.9times the deflection of the fortuitous one... (why? because the impact of length on deflection for our/any curved beam is less than on the comparable straight one and the formula for the deflection of straight beams cubes the beam span/length)... Which suggests that our arch-beams (with deflection less than 6/10ths of an inch), being substantially stiffer than our longitudinal beams, will stiffen the vault. (Intuitively, our shallow arch-beams of those dimensions would deflect even less since ours are supported at four points, spaced 25feet apart, by the 2foot thick internal walls which are as capable of loadbearing as the designed endwalls). Finally, the 2nd rule adds to this overall stiffness conclusion based on the shell-continuity rather than on the simpler beam-grid analysis, suggesting that the beam depth could have been a mere 2/3rds of the depth used in this design. The radius, not span, of the shallow arches is 93ft, or 1.7times the radius of the dome which is 55ft. is 5times the dome´s, or about 6/10ths of an inch.